She was fundamental in helping fund a number of educational, religious, artistic organizations. Utah Valley University's Noorda Theatre in Orem was founded by Ray and Lewena "Tye" Noorda, who died Saturday at the age of 90. Lewena "Tye" Noorda, a Utah philanthropist and arts lover, died Saturday at the age of 90. 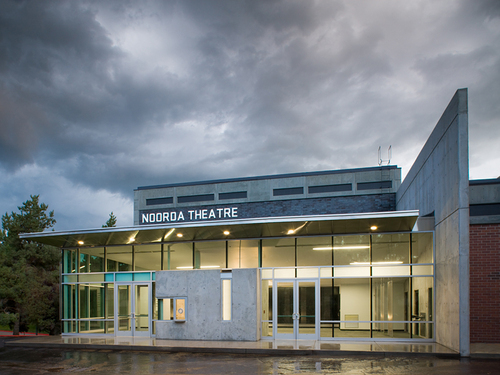 A gifted musician, writer, director, poet and songwriter, Noorda was instrumental in helping fund a number of educational, religious and artistic organizations. "She was a wonderful person without guile," said Doug Gale, executive director of the Scenic View Academy in Provo that helps adults with learning disabilities and autism. "She did not want recognition. They [Noorda and her late husband Ray Noorda] were very free with their money and helped lots and lots of causes. They were very private with the recognition for what they were doing. They were out there giving away money. They didn&apos;t need the recognition." After Ray Noorda died, Lewen Noorda and her four sons donated $30 million to the Ray and Tye Noorda Oral Health Sciences Building at the University of Utah. Rena D&apos;Souza, dean of the School of Dentistry, said Noorda&apos;s generosity was evident not only financially but also in her commitment to making quality dental care accessible to everyone. "The mission of the School of Dentistry draws inspiration from Tye Noorda&apos;s commitment to ensuring care for needy children," she said. "We are proud to honor her legacy by serving those children whose families don&apos;t have the access or resources for good dental care." The donation and legacy of the school has special meaning to Tye Noorda, who lost two teeth in an accident as a newlywed. The couple weren&apos;t able to repair the teeth for a year, so she understood the need for access to oral healthcare. U. President David W. Pershing said Noorda leaves an enduring legacy of generosity and kindness. "With Tye Noorda&apos;s passing the University of Utah community has a lost a great friend and benefactor," he said in a statement. "Many of the students who receive their education at the Ray and Tye Noorda Oral Health Sciences Building will go on to practice dentistry in underserved areas of the state, improving the lives of countless Utah families. Their contributions will be an enduring reminder of Ray and Tye Noorda&apos;s vision for higher education, commitment to community service and love for our state." The couple also donated large sums to a theater at Utah Valley University and the Scenic View Academy. They were also active in a number of foundations including Angel Partners, Worth of a Soul and the Ray and Tye Noorda Foundations, which will continue to operate. "She&apos;s given lots to the LDS Church, helped start a dental school in Salt Lake City and helped build the Noorda Theater for Performing Arts at Utah Valley University," said Gale. "She wanted to see young talent develop. She was a champion for public speaking and appropriate expression. She always had a passion for doing that and helping improve public speaking in church." Noorda was born Dec. 26, 1923, in Freedom, Utah. After graduating from high school in Sanpete County, she moved to Salt Lake City where she worked as a secretary and a model. She attended the University of Utah, where she studied speech and drama. While working as a model in New York City, she received the stage name "Tye" from Nat King Cole&apos;s manager. After moving to Salt Lake City, she met Ray Noorda. The couple were married on Aug. 4, 1950. The marriage was solemnized in the Salt Lake Temple. Ray Noorda was CEO of Novell from 1983 to 1995. He passed away in October of 2006. Tye Noorda was active in The Church of Jesus Christ of Latter-day Saints, where she often used her passion for the dramatic arts to write and direct road shows, which often displayed her sense of humor. Noorda was preceded in death by her daughter, Val Marie. She is survived by four sons, 13 grandchildren and four great-grandchildren. A viewing is scheduled Wednesday from 6 to 8 p.m. at the Sundberg-Olpin Funeral Home at 495 S. State Street in Orem. Funeral services are scheduled Thursday at 1 p.m. at the Sunset Heights Stake Center in Orem. Viewing hours prior to the funeral will be from 11 a.m. until 12:30 p.m.